More about the owner than the dog. Clearly, I love dogs and books, but I get especially excited when the two join up, hence DogearedTails! This story in particular is about Simba, a white lab with a big personality. Aren’t all labs like this?! You can’t help but smile at their lovableness. However, I heard a lot about Simba’s owner, David, and not a lot about Simba himself while reading this one. The main plot is that David and his family are moving across country, from California to New York, to relocate due to the wife’s business. Unfortunately, Simba is not doing well medically because of old age so the risk of flying is off the table. David, Simba, and their friend Erik, decide a road trip would be a good compromise in order to hopefully have Simba see his family one last time in the new home. Just felt like a story that had been done before and that the writing was not cared enough for to really dig into Simba’s character. When someone picks up a book with a large picture of a puppy on it, you best believe they are dog lovers and want to hear every detail about that animal. This all just felt on the surface. 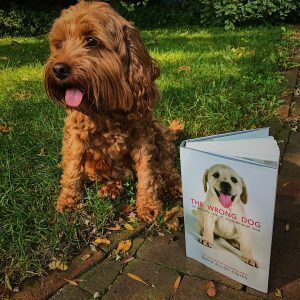 Of course, I give credit to anyone who does take the time to write anything about my furry pals so I do not regret reading it, but I can think of several dog-books that are much more passionate. I do miss Simba and glad he received a good life, but I wish this tale gave me even more of his cooky events in that great life!